Over the past few days, I had the chance to experience a unique compression sock by LemonHero. And what sets it apart from its competitors is mainly the zippered functionality that goes down the side of the sock. And I was pleasantly surprised by how simple and convenient it was. Having the zipper on the side of the sock provides several benefits to the wearer that you can’t get in other traditional compression socks and stockings. Combine that with the open-toe design and you get a compression sock perfect for everyday use and recovery. With that in mind, I’m going to break down these 3 aspects that make the LemonHero Zippered Compression Socks that right choice for individuals who want something more than the standard compression sock along with increased comfort and wear. If you have any history with other compression socks, you’ll know that they can sometimes be too hard to put on. Usually, you have to jam your foot down the sock tube to try and snugly fit your foot. But the zippered functionality allows you to not have to deal with that stress. I was surprised by how easy it was to put on. 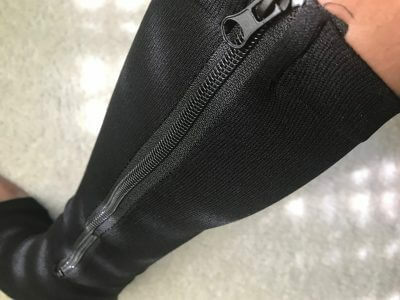 All I had to do was simply unzip the sock before putting it on, put my foot through the designated foot hole, and then zip it back up. It got me thinking that this makes it great for elderly individuals or people who have a harder time dressing themselves. The stretchiness of the material and the zipper make this one of the best compression socks to put on by yourself. I’d recommend this compression sock by LemonHero over other brands if you’ve found difficulty and inconvenience dealing with putt on a compression sock. With them being so much easier to wear, these socks are perfect for casual wear around the house for individuals with limited mobility. You can easily put them on and experience the benefits of compression socks without some of the stress that comes with trying to to put them on. The open-toe design of the sock provides increased comfort and air to travel throughout. If you have experienced sweaty feet and find that other compression socks are not doing enough to combat the moisture and odor build-up in the sock, this open-toe sock design might work for you. I’ve found that the LemonHero socks provide a more “free” design compared to other socks I’ve tried. From my personal experience, I saw that my feet felt less gross or sweaty after a long period of regular day-to-day activities. The construction is breathable and air travels better wearing these socks. While these socks won’t magically solve your problems of swelling or soreness in your legs, it can help reduce it significantly. This works great for individuals who are experiencing gentle to mild varicose vein or swelling. If you experience swelling or fatigue in your feet and legs throughout the day, I highly recommend getting this socks to help combat those symptoms. The 15-20mmHg graduated compression range is perfect to help almost all individuals with their common symptoms of pain. I personally found that they myself using them after a run or going to the gym. The sock’s graduated compression helped me with recovery after a workout. I just put them on and found that my legs felt better after wearing them around the house for a few hours. I saw that a good portion of my soreness wasn’t noticeable after a few hours of wear compared to a normal day without. After reading other reviews from people who have also worn the sock, we shared the same sentiment that the socks helped deal with our minor symptoms. For those individuals, with stronger symptoms of pain or soreness, these socks could be part of your recovery and rehabilitation process as well. The answer is a resounding yes. 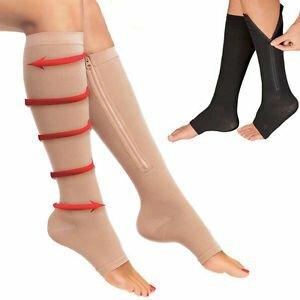 It’s unique compression sock that solves a few of the problems that other traditional compression socks struggle with. And to top it off, at the time of writing this article, it is being offered for a competitive price making it budget friendly. In the past few days wearing these compression socks, I can confidently say I’ll be wearing these more often when I need a compression sock I can easily zip down, put on, and relax in. They’re the perfect choice to wear when I just want to relax and need something with a little more freedom. 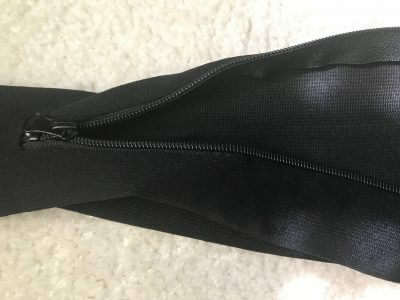 The zippered aspect of the sock makes it easy to put on and provides a much more secure wear compared to a regular elastic band at the top of a compression sock. That functionality alone provides several benefits that can make your life easier. 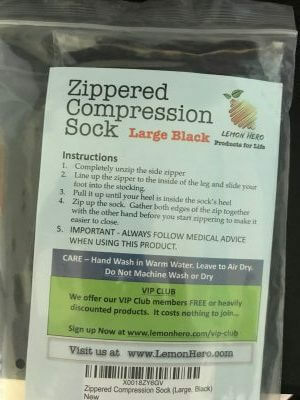 If you want an everyday compression sock with a unique design, I recommend getting the LemonHero Zippered Compression Socks.